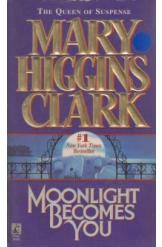 Moonlight Becomes You by Mary Higgins Clark Sci Fi, the book is in a good condition, all pages intact. Maggie meets with her stepmother after many years, agrees to meet her and then finds her murdered. Next she finds her stepmother's friend murdered, and then the connection among the deaths of wealthy older women on Newport. A chilling suspense story.